Wildfires which raged through parts of America in 2017 led to the largest bill ever - $2 billion – as fires burned more than 10 million acres. 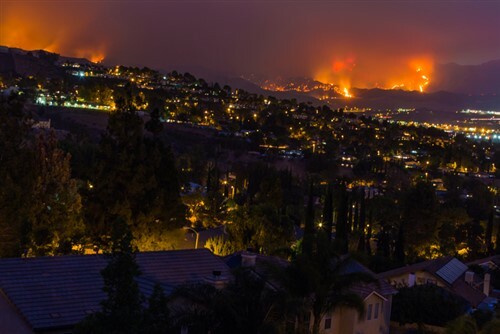 Now a new study says that the number of homes at risk from wildfires has been greatly increased by a flurry of homebuilding near wild areas since 1990. University of Wisconsin-Madison researchers found that an area the size of Washington state has been used for homebuilding on the wildland-urban interface (WUI) where homes and wild vegetation meet, between 1990 and 2010. "We've seen that many wildfires are caused by people living in close proximity to forests and wildlands. And that when these fires are spreading, they are much harder to fight when people are living there, because lives are at risk, because properties have to be protected," says Volker Radeloff, a professor of forest and wildlife ecology at UW-Madison, who led the study, published in the Proceedings of the National Academy of Sciences. As well as the potential risk to homeowners, and impact on mortgage lenders and insurers, there are environmental risks to increasing the density of building on wild land. Radeloff adds that there are things that can be done to mitigate the risk. These include land management practices to limit the negative effects of expanding WUI, such as vegetation management, use of appropriate building materials and zoning regulations informed by wildfire risk. "I think it reflects that people love nature. That's a very good thing. They're making the biggest economic decision of their life and it reflects an affinity to be close to wild places," he says. "That is great -- it's just that when millions of people do it at the same time that the effects are what I don't think anyone wants to see. And dealing with that is what I hope our work will help do."